A new spin on hard surface cleaning. 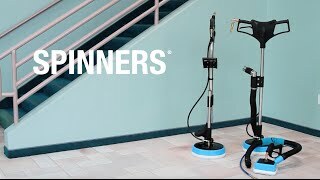 Designed with the professional in mind, the Tile & Grout Spinner® uses high pressure to simultaneously power wash and extract water from a variety of hard surfaces such as concrete, grouted tile, ceramic tile, rubber studded floors and more. The Tile & Grout Spinners® set a new standard in hard surface cleaning. Removable brush ring with built-in vacuum relief for instantly dry surfaces! 12" x 12" x 51.5"
13" x 13" x 52"